Mövenpick Hotels & Resort expanded its fleet of river cruise ships on the Nile with five new vessels -- SS Misr, once the royal yacht of Egypt’s former King Farouk; the boutique luxury sailboat Mövenpick SB Feddya; the long cruise vessel Mövenpick MS Hamees; as well as the Mövenpick MS Darakum and Mövenpick MS Sunray. The Zurich-based hotelier claims the title of the largest international cruise operator on the Nile with a total of eight boats. The SS Misr is the fleet’s flagship and is the only internationally managed steamship in Egypt. Built in the United Kingdom nearly 100 years ago, SS Misr is a sort of floating time capsule/museum from the reign of King Farouk, who converted it to his private yacht in 1938 and used it for his birthday celebrations. The boat still has artifacts reflecting the Farouk period, such as phonographs, telephones and radio sets plus letters from the king to his mother. The gleaming brass, chrome and wood of the lovingly maintained steam engine room, with original spare parts, is another major attraction for passengers during their on-board tour of this fascinating and historic vessel. SS Misr’s striking décor faithfully recreates classic eras for each of its 24 individually designed suites. Eighteenth century France is reflected in the Louis XV and XVI rooms. Other suites reflect 1930s Art Deco, a 19th century English country house or the grandeur of the Ottoman Empire. The kitchen of SS Misr actually serves a selection of dishes from Farouk’s favorite menus. The wait staff dresses in the style of his period. Mövenpick SB Feddya is a reframing of the design and utility of the traditional dahabeya, the traditional Egyptian sailing boat, with a fresh modern approach. Despite being the smallest dahabeya on the Nile, Mövenpick SB Feddya has more space for passengers than a traditional craft. Four unique suites have private patios or balconies. Chefs create dishes to order. SB Feddya is the only Nile sailing boat with 24-hour butler and laundry service for each suite. 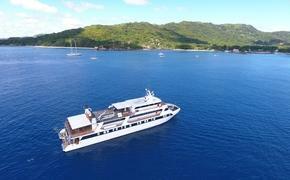 It is available for charter as well as individual bookings. Available again after a gap of 18 years, a long cruise voyage is back on the Nile when Mövenpick MS Hamees embarks on the journey between Cairo, Luxor and Aswan as of April 2013. The journey takes 14 nights, with more than 80 hours’ sailing between Cairo and Aswan, and a further 12 hours up river to Luxor. The long cruise creates a new route to less familiar monuments and temples such as the Hawara Pyramids of Amenemhet III, the mausoleum of Isadora and the Tel Elamarna, Akhenaton’s Royal City which he briefly made Egypt’s capital. The SS Misr, Mövenpick SB Feddya, Mövenpick MS Hamees, Mövenpick MS Dakarum and Mövenpick MS Sun Ray now fly the Mövenpick flag alongside the existing Mövenpick MS Royal Lotus, Mövenpick MS Royal Lily and Lake Nasser cruiser Mövenpick MS Prince Abbas, to give Mövenpick Hotels & Resorts an unrivalled variety for travellers looking for that unique blend of Egyptian warmth and hospitality infused with Swiss service and heritage.